The kitchen extractor is the unsung hero of the appliances. It can often set the theme for a kitchen or be a real focal point. Here's how to keep it in tip-top shape. Whether it is a curved glass floating canopy over an island unit, or a seamlessly integrated telescopic hood built into a wall unit, your extractor fan will prove to be a great help when it comes to reducing cooking odours in the house and directing steam and air borne grease away from your kitchen doors which can reduce their life span. But how do you maintain your extractor to optimise its performance? 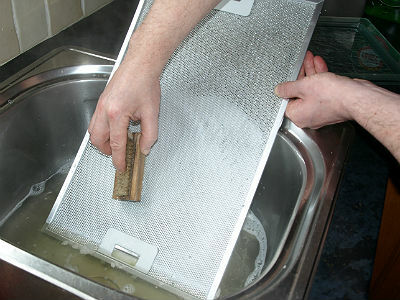 The trick to this is in the cleaning of the filter door. 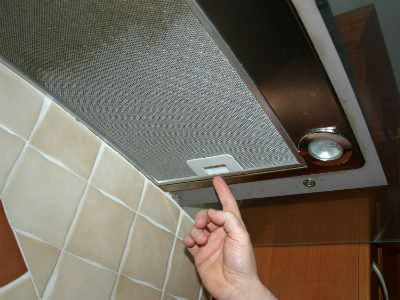 All modern extractor hoods now come with a stainless steel grease filter built into the door. This filters out the grease in the air which is being drawn out of the kitchen by the motor in the hood. 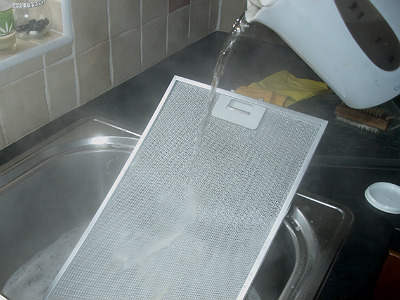 However when the filter door starts to become clogged with grease and other air borne particles it will struggle to draw through the air and become less effective. 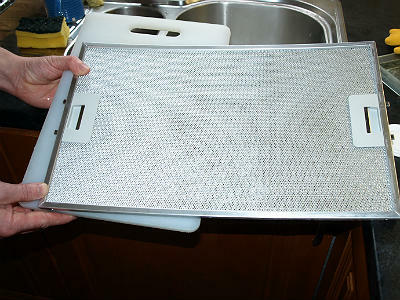 If you haven't cleaned your filter door in a while, then there's no need to panic. 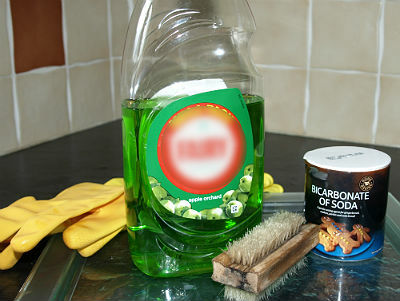 Here at Award Bedrooms & Kitchens we have the perfect, deep cleaning formula. 1. Bicarbonate of soda ( baking soda). 3. A few kettles of boiling water. 1. Remove door from extractor fan. There should be one or two open / close switches or a retractable button. 2. 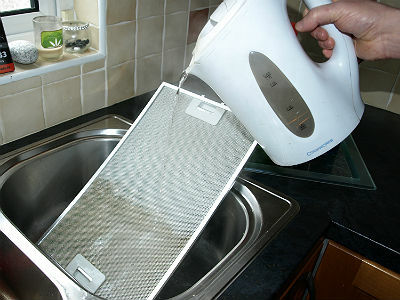 Place the door in sink or basin and pour over with the boiled water. This will start to dissolve the built up grease. ( Don't forget to refill and boil more water). 3. 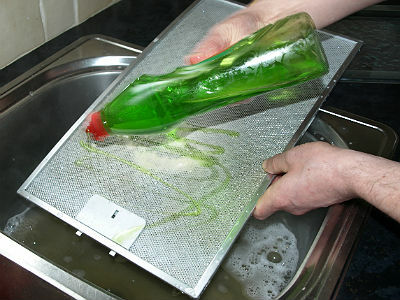 Cover the door with a liberal amount of washing up liquid and bicarbonate of soda. 4. Start to rub the nail brush around in small tight circles. 5. This will start to draw out the grease and you will start to notice small balls of fibres coming out also. 6. Repeat this action on both sides of the door while carefully dipping the nail brush into the hot water between doing the circular rubbing actions. 7. 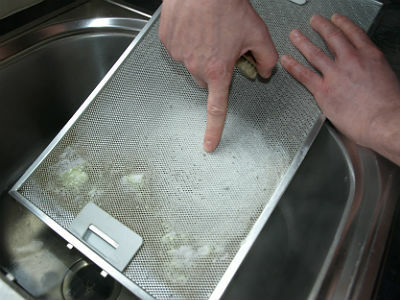 Rinse door thoroughly with more boiling water . Repeat steps 3 and 4 if not completely satisfied with first attempt and allow to dry on draining board. Result! The door is now completely clean. 1. 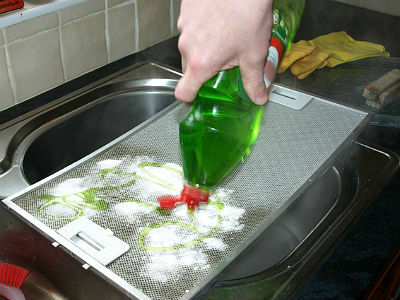 The key to avoid giving your hood a deep clean is simply to give a quick clean with soapy hot water more regularly. 2. Some extractor fan doors are also dishwasher safe but this will not give them a deep clean, although is very handy for regular maintenance . 3. 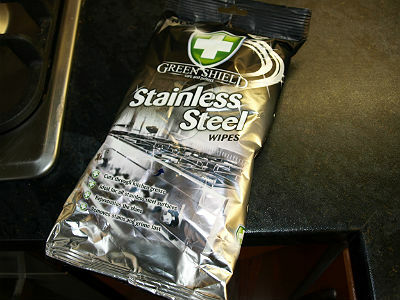 For any stainless steel exposed on your hood, stainless steel wipes are available in the cleaning isle of most large super markets. They are very convenient and are a great way to avoid leaving any streaks left by soap and water solutions.